Description: Ascending shrub to c. 1 m high; glabrous to densely tomentose with simple, 2-branched and stellate hairs. Upper leaves sessile, lower ones petiolate; lamina narrow-obovate or narrow- to broad-elliptic, to 5 cm long and 4 cm wide, margins toothed, apex obtuse on basal leaves, acute or 3-lobed on upper leaves; petiole to 5 cm long; stipules to 10 mm long and 3 mm wide. Calyx to 12 mm long. 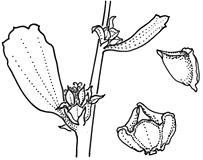 Petals to 9 mm long, white or green; lobes flat and spreading in male flowers, erect and keeled in female flowers. Staminal tube usually shorter than the petals; anthers to 25; staminodes often present in female flowers. Carpels 5.